Watchmaking of today is strongly based in what was discovered some good century (or two) ago. Let’s face it – the chronograph, the perpetual calendar, the minute repeater – all this high horology complications, not to mention every smaller one, came to life ages before the great creation of our time, thanks to which you can read this text now – the internet – was even considered a possibility. Breguet invented the mighty tourbillion more than 200 years ago – believe it or not. Keep this in mind and when you look at the industry nowadays, pretty much every new great piece is thing of the past. True innovations come either in a way of crazy re-interpretations of it or in the form of new, modern technologies. I bet that if Breguet could have used all the stuff we know today, his watches would have been a whole different thing, both in technical and material aspect. 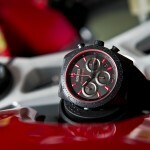 In fact I find the materials used in watchmaking the most valid innovation of our times. Silicon, carbon fiber, sapphire, titanium – all those modern materials somewhat revolutionized the way of making watches, be that the case, the dial or movement components. 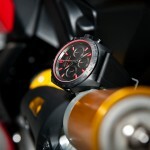 I have a weak spot for sporty watches in full black, therefore my favorite contemporary composite is ceramic. The problem with it is that it costs a lot… but every rule has its exceptions? For years it existed side-by-side with Rolex, bringing up some true icons like the Snowflake Submariner or the Montecarlo. And that, at some point, it went into oblivion. The rebirth came at 2010 BaselWorld, and already the premier collection with the magnificent Heritage Chronograph created an incredible buzz. The Tudor Fastrider Blackshield came 3 years later. 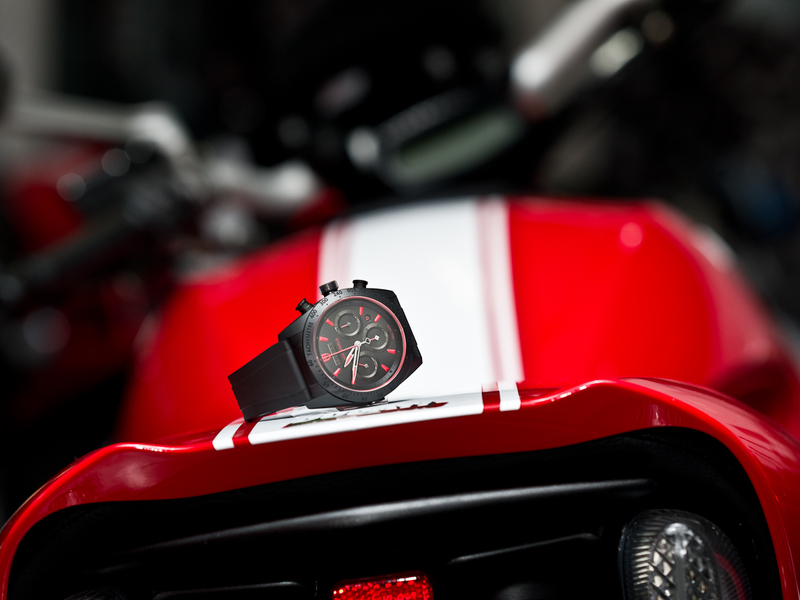 Main focus of the watch is the already mentioned ceramic – a brave choice by a small Tudor. 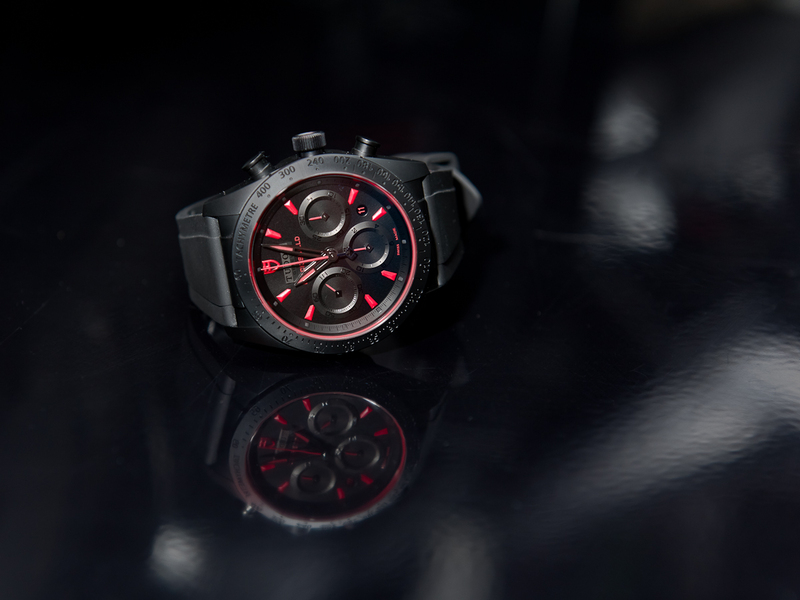 Most brands from this market segment would easily go with PVD or DLC coating on steel, as a simple way to make an-black watch, but the Geneva based company preferred to undertake a more difficult, more expensive way. Even more difficult if you consider that Rolex does not make ceramic cases at all. Fastrider’s Blackshield body is all made from a scratch resistant, hard and light zirconium oxide. Construction is a monoblock (meaning one piece) with attached ceramic bezel (with molded tachymetre scale) and black, full caseback. 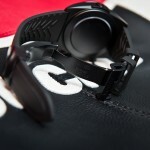 Black pushers, crown and rubber strap’s buckle (neatly finished might I add) were all made using the blackened steel. Matt finish highlights very impressive quality, with all the small details and different surfaces adding to a very well made and very handsome case. Even the date correction button at 9 o’clock was given a very nice frame and detailing. There were two different dials made. One has gold-beige applications the other one – subject of this review – comes with bright red applications. 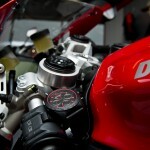 This one was my selection because it is both more sporty and corresponds better with Tudor’s main partner – Ducati. 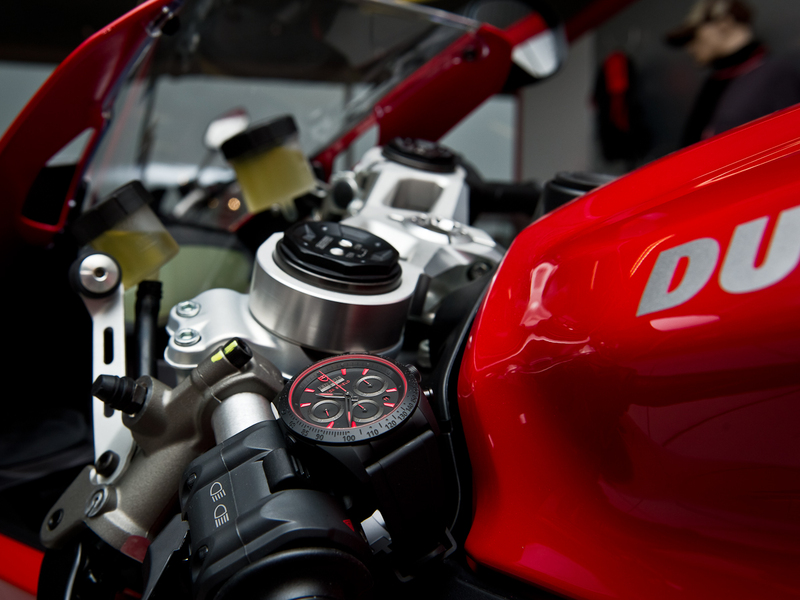 If somehow the name does not ring a bell for you, Ducati is a famous Italian motorcycle maker, founded and based in Bologna since 1926. 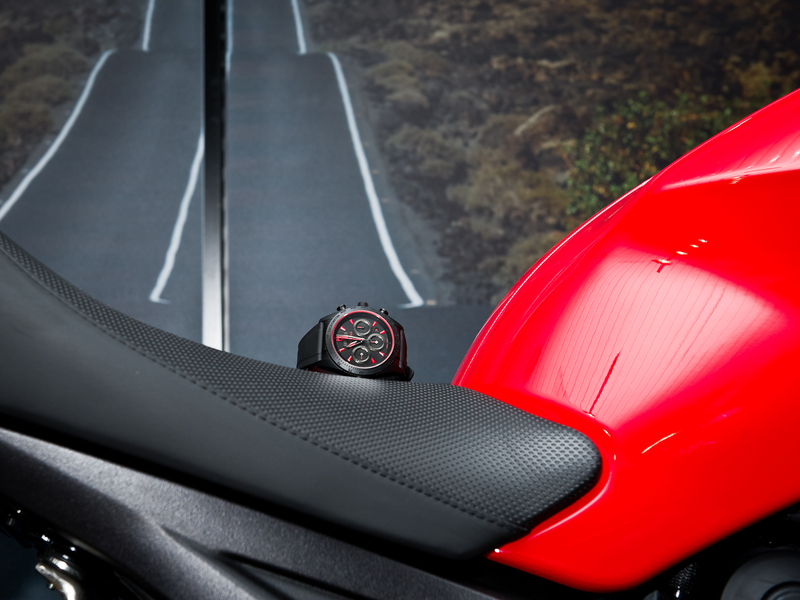 Together both companies created a joint marketing campaign, including the red-black, one-of-a-kind Ducati Diavel Carbon bike – a perfect match for the red-black timepiece. 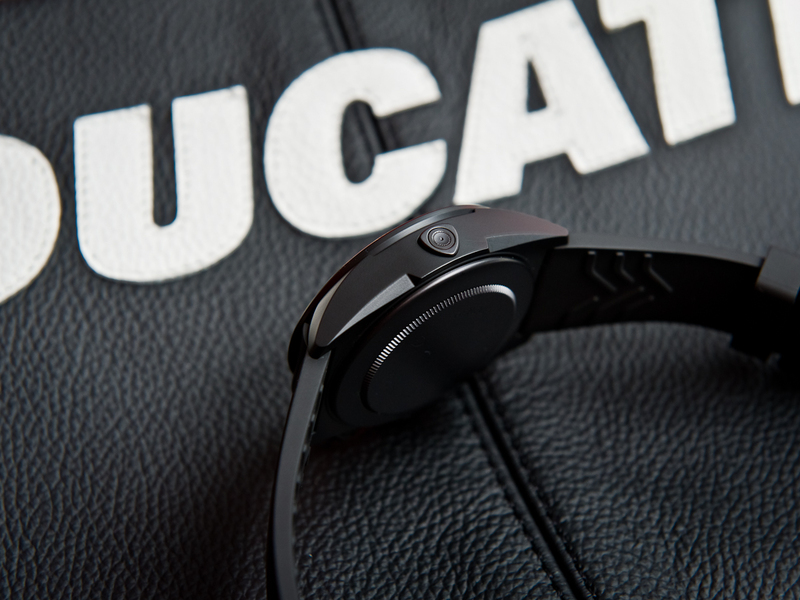 haracter and quite cool, sporty feel. It may also not be the most readable dial you’ve came across, but that is not a serious problem. The display includes central hour and minute hand, small second at 9 o’clock, round date window at 4:30 and the chronograph. 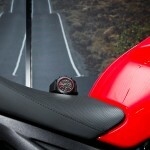 This one comes with a central seconds hand and two small sub-dials: 30minutes at 3 o’clock and 12hours at 6. Wearing the watch for full 2 weeks gave me a lot of pleasure. 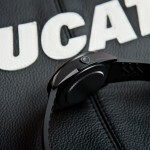 Not only I like it all-black, I also loved how the 42mm ceramic case feels on the wrist. 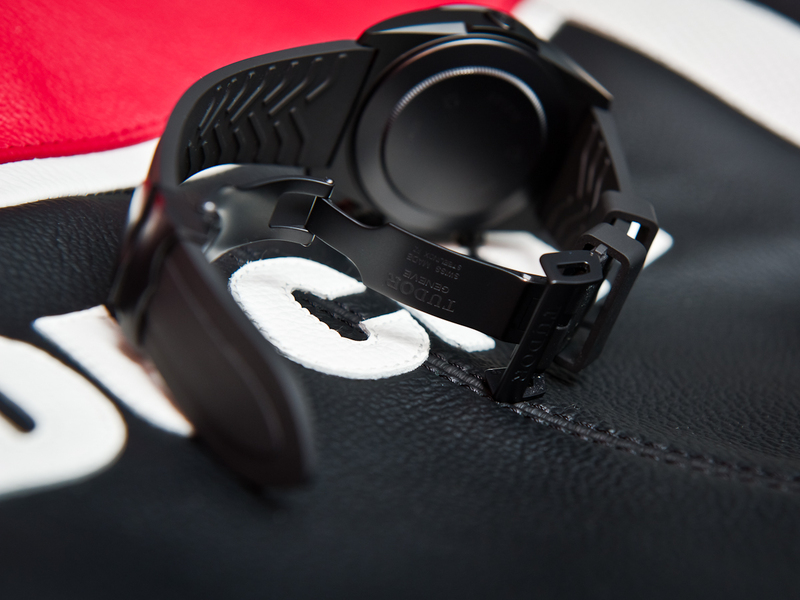 Stop-watch work is smooth and setting the timepiece with the crown is not a problem at all. 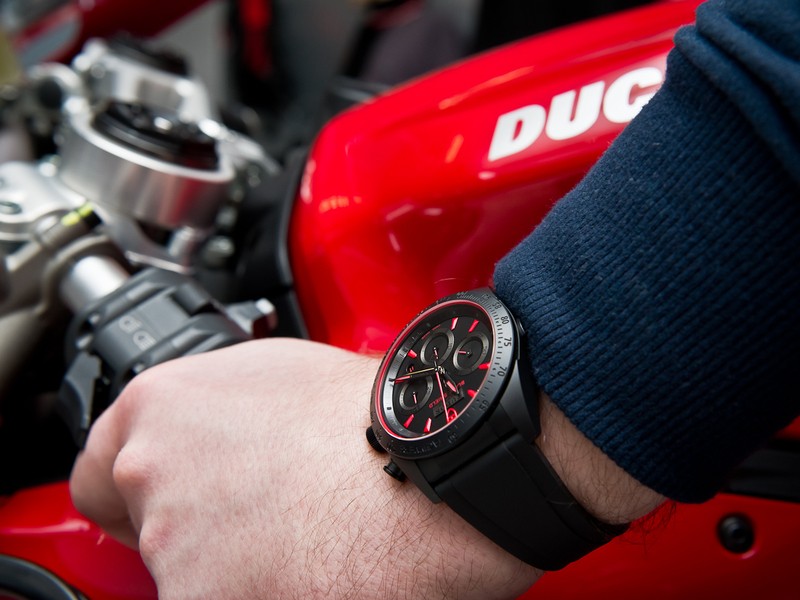 The quality is all there, black integrated rubber strap works well and so does all the mechanics, which brings us to the movement. Making an affordable watch unfortunately has its limitations – and most of the time it means the less impressive movement. 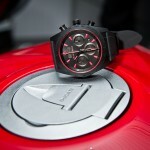 Tudor does not make his own calibers nor use any of the Rolex power horses. Tudor Fastrider Blackshield works with a robust and well tested ETA Valjoux 7753 (7750 version with a date). 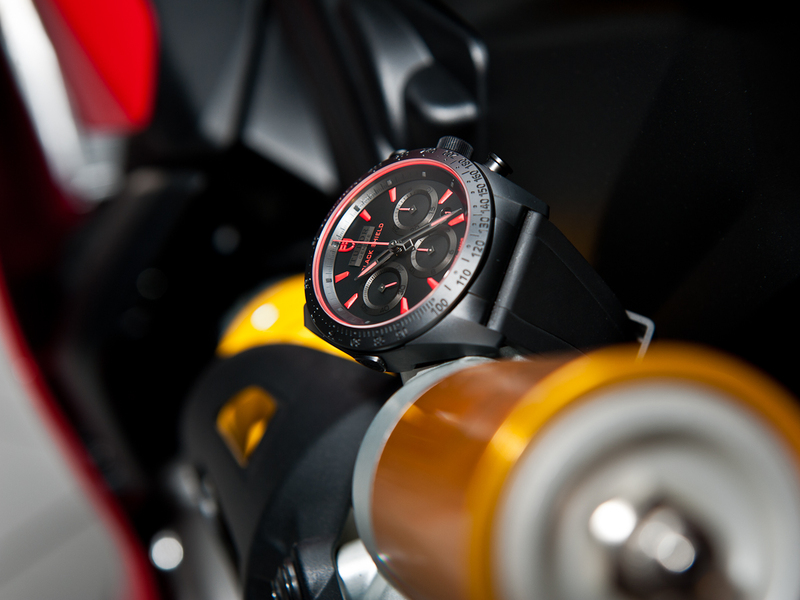 It is an automatic chronograph caliber with 46h of power reserve, 4Hz balance wheel and a day of the month. Millions of pages have already been written on this probably most popular mechanical chronograph ever build, so let’s just say it works fine and keeps a proper time. 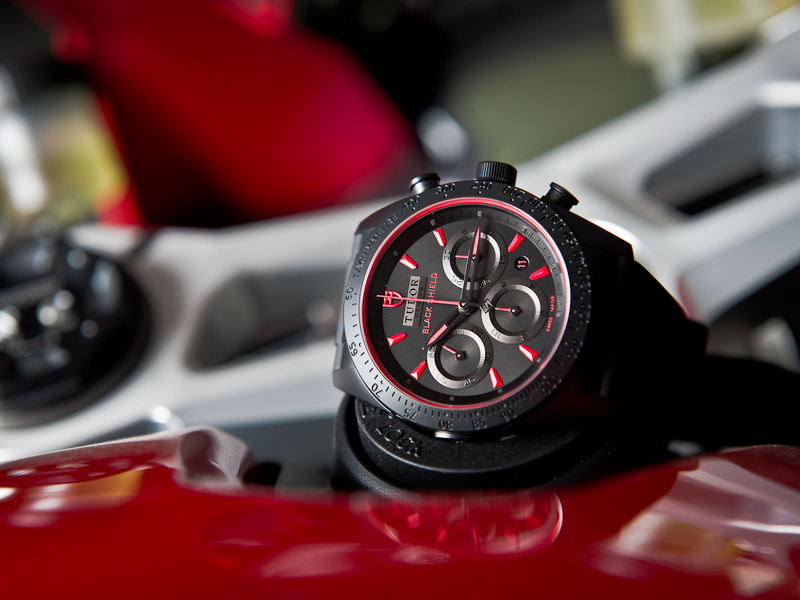 Perhaps the single thing that strikes the most about Tudor’s ceramic watch is the price tag. I said before, that ceramic is quite an expensive material to use, not to mention for a small brand, yet somehow Tudor managed to price the piece at 4.700CHF. 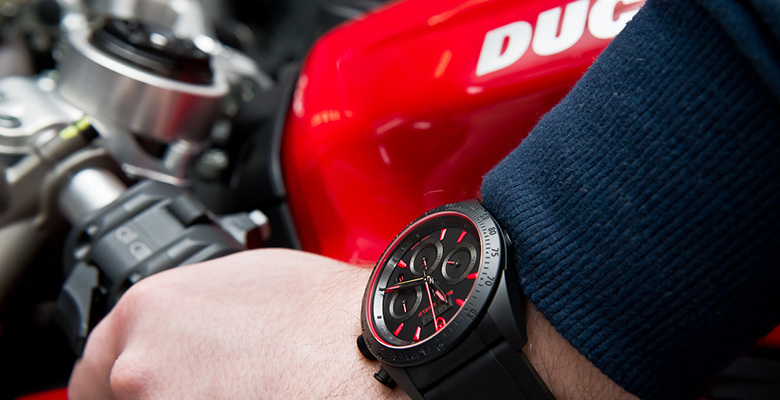 It is way lees than any other full ceramic watch on the market, but still the quality is all there. 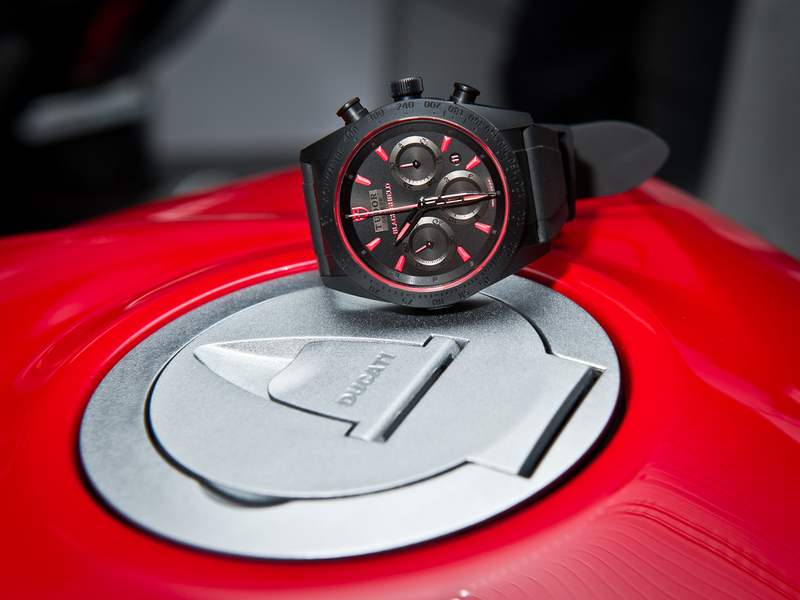 I almost felt like wearing a black Daytona – those saying that Tudor offers Rolex quality are certainly not far from truth. I enjoy the brand a lot, Heritage Chrono with grey dial is top of my wish-list and the Tudor Fastrider Blackshield is no doubt a watch to consider. Especially if you like it black, sporty and modestly modern. And try to get a Ducati bike to go with it – I enjoyed them, stationary, only for a brief photo shoot session, but boy would I love to take one home. 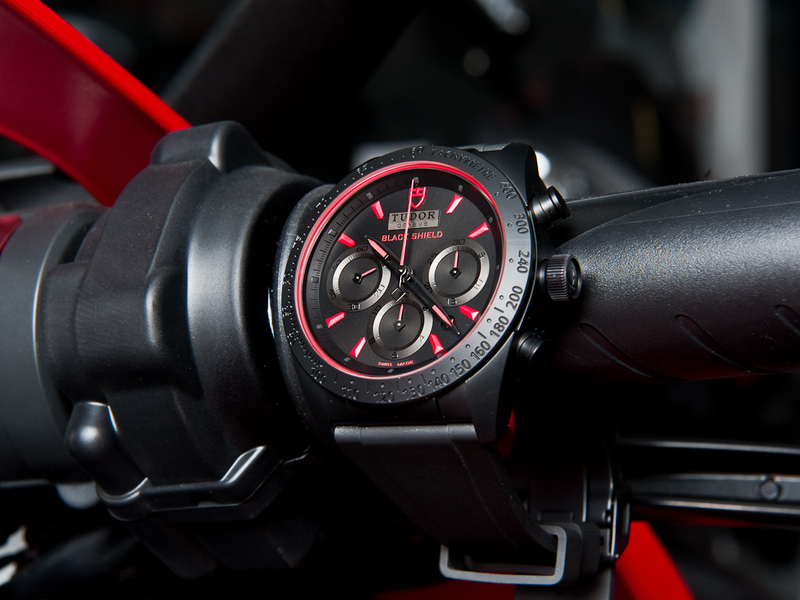 Click-Here to read the Official Annoucement of the Tudor Fastrider Blackshield that we published in December 2013. 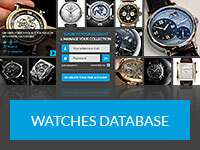 Łukasz started his journey into watches in 2007. First as a passionate admirer, then as the co-founder and Editor in chief of the CHRONOS24.pl - the biggest on-line watch portal in Poland, dedicated entirely to fine, mechanical timepieces. 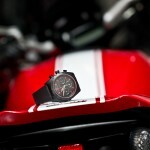 Watches have become his biggest passion, hobby, a way of life (along with some other non-related things). He also writes for Watch-Anish and some smaller publications in Poland. His speciality are the independent, extraordinary watchmaking creations that go way beyond the traditional understanding of a mechanical watch.